Boxing's only eight-division world champion, Filipino ring icon Manny "Pacman" Pacquiao (57-6-2, 38 KO's) has a long list of names of possible opponents for his supposed last hurrah in 2016, but one name is leading the pack -- unbeaten junior welterweight champ Terence "Bud" Crawford (27-0, 19 KO's) of Omaha, Nebraska. Pacquiao, in what will perhaps be the last time fans see him in the ring, will climb up the apron for the final time tentatively scheduled on April 9, 2016, despite still being physically able to maintain pole position in his division now that Floyd Mayweather Jr. has retired. A healthy sizable contingent still hold on to the allure of a rematch between Pacquiao and the undefeated pound-for-pound king Mayweather, but at the moment, Mayweather has yet to respond favorably to Pacquiao's call for a 'do-over'. Other fighters who have been listed as possible Pacquiao opponents are former stablemate Amir "King" Khan, middleweight hotshot Canelo Alvarez, and of course, Crawford. After reviewing tape of Crawford's most recent victory over Dierry Jean -- a bout which he won by 10th round knockout -- Pacquiao's trainer Freddie Roach gave Top Rank head Bob Arum the green light on Crawford. 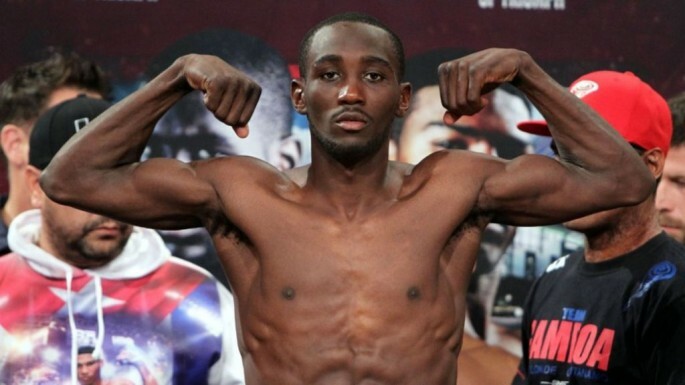 As a fighter, Crawford is one of the sport's fastest rising stars, coming into prominence with a shock TKO over highly-regarded Yuriorkis Gamboa. Crawford has also stopped his last two opponents, so he's on a good little run as of the moment. "I spoke to Bob Arum and he asked if I would be willing to have Pacquiao fight Terence Crawford," said Roach, in an intervie with TV Azteca. "And I said yes, but the final decision is up to Manny." Pacquiao is currently on hiatus, having only fought once this year, skipping his usual fall appearance due to a torn right rotator cuff injury suffered during his fight camp for the Mayweather bout. Pacquiao attributes his loss to the undefeated American because he wasn't able to use his right hand effectively during the fight, making him predictable and essentially a one-armed fighter which resulted in his lowest punch output in years. The majority of fans clamoring for a Pacquiao-Mayweather rematch believe Pacquiao will do much better in a second go-around with the use of both his limbs. Mayweather however, historically gives even better performances in rematches which should be noted. Regardless, Mayweather has yet to show any interest in coming out of retirement to shoot for win number 50 to eclipse the legendary heavyweight Rocky Marciano. Another reason Mayweather might consider a rematch with Pacquiao is of course the economic and financial impact of a rematch. While it may not break the economic records set by the first fight, it is still easily the second biggest fight in history and is almost guaranteed to be a financial success regardless of the diminished lustre. Why Doesn’t Manny Pacquiao Fight Gennady Golovkin?